Though Tokio Hotel may seem to be a new band to American audiences, this German pop rock group has actually been around since 2001 and recorded two full length albums before now. 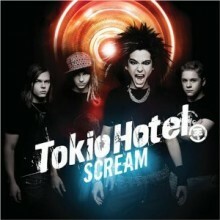 However, their third release Scream is not only the first album of theirs to be released in the United States, but also their first to contain songs entirely in English. And while they are sure to generate mainstream attention, in their current state Tokio Hotel is more likely to be a flavor of the month rather than a long lasting success. I do have to give vocalist Bill Kaulitz credit, as he does know how to sing in such a way that makes the most of his limited range. Throughout the course of Scream Kaulitz likes to alternate between louder and near screamed ranges and more mellow, emo style singing. This is sure to appeal to the mainstream crowd, but is admittedly fairly close to many of the artists that American audiences have been listening to for years. Because of this the vocals aren’t likely to have as big of an impact, despite Bill Kaulitz being a competent singer. What makes Scream a bit of a dud is its overwhelming sense of blandness. The instrumentalists aren’t the worst on the market by any means, but their compositions sound exactly like just about every other mainstream pop rock/emo band currently out there. At their best, Tokio Hotel’s music sounds a little like AFI lite (think current AFI) and at their worst they are just another pop rock band that is no different from everything else currently on commercial radio. And while this is sure to get them some listeners, it’s not likely that many people will remember who they are in a couple of months. Tokio Hotel isn’t horrible, but they have some serious work to do if they hope to leave any sort of lasting impression on their listeners. Their style definitely fits in with what might be considered trendy right now, but there are numerous other bands that do it better. I’m not going to write this group off quite yet, but it’s going to take a lot for them to be more than just a by the numbers commercially oriented band.